A real smile killer could be lurking in your mouth. You can have flawless, straight white teeth, and still lose them all to gum disease. 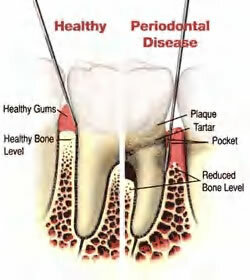 Gum disease, or periodontitis, is the number one reason you need to maintain your regular dental care. Even serious gum disease can have few symptoms, and only the care of an experienced dentist and dental hygienist, including regular x-rays, can help detect early warning signs that could be devastating to your health. Periodontitis is similar to arthritis. It is a chronic inflammatory disease that attacks the supporting structures of your teeth. By the time you experience noticeable systems, extensive damage has probably already been done. The only visible reminder of the specter of gum disease might be a substance called tartar. Tartar builds up on your teeth and can cause gum disease and other problems unless you have your teeth professionally cleaned on a regular basis. This diagram helps illustrate the unseen effects of untreated gum disease. Notice that the affected areas of the tooth are below the gumline, and not at all visible to the naked eye. This kind of damage may only be detectable by a professional exam, including x-rays. Don’t lose your teeth to simple neglect. Whether you suspect you have gum disease or not, keep regular appointments with your dentist, and have your teeth regularly cleaned by a dental hygienist. If you’ve been diagnosed with gum disease, you’ll need to get special treatment if you want to keep your teeth. First, you will need a special deep cleaning that goes under your gums. This is called “scaling” or “root planing”, and it is generally performed while you are sedated. This kind of thorough cleaning is usually spread out over several appointments, as it can take hours to complete. You may also be placed on an antibiotic to address any infections. When your gum disease has been successfully treated, you will need to change your dental care habits or risk a reoccurrence. You will need to have regular cleanings more often—every three months instead of every six months. You will also need to step up your home dental care habits, including flossing every day. Dr. Hadgis may be able to provide suggestions for home appliances that will help you keep gum disease at bay. Your oral health has a profound effect on the health of your whole body. The last decade has seen a focused effort by the American Academy of Periodontology to increase public awareness that untreated gum disease can wreak havoc on your general health. Research has linked gum disease to other chronic inflammatory conditions, including but not limited to: diabetes, Alzheimer’s disease, and cardiovascular disease. Contact our office today, or use our convenient Make an Appointment page, to make sure this unseen menace isn’t hiding behind your smile.